Located along the picturesque Florida West coast, Tampa is home to beautiful beaches, nature preserves, multiple museums, and other entertaining attractions. Between the various outdoor activities, theme parks, and attractions in the Tampa Bay area, there’s plenty to experience for first timers. Whether you’re in town for business or on vacation, enjoy a weekend along the water in this coastal city. Coordinating travel in a new city can be daunting, but Falcon Charter Bus is available to make group travels as easy as possible in Tampa. We specialize in coordinating streamlined and efficient group transportation for various events and types of groups. So if you’re in town for a sports event, business trip, school trip, or even a personal vacation, we have a private full-sized motorcoach or minibus to meet your needs. No matter the size of your group, multiple bus options are available. Minibuses can accommodate groups of 18 passengers to 25 passengers, while full-sized motorcoaches fit up to 56 passengers. Each bus we charter comes with the option of choosing premium amenities like WiFi, televisions with DVD players, plush reclining seats, bathrooms, and climate-controlled interiors, to keep you and your group comfortable while traveling to Tampa. If your group has flown from out of town and requires an airport shuttle from Tampa International Airport, a charter bus is perfect to get your group to and from locations. We can also provide long-distance transportation options for travelers coming to Tampa from other cities in the Southeast like Atlanta, Miami, or Charlotte. If you’re not sure what’s available to experiences in Tampa, we’ve created a sample itinerary for first-time travelers to use during their trip. These Tampa Bay attractions are a must-see for first timers! Begin the day off right with breakfast at Oxford Exchange, a chic restaurant serving breakfast and brunch near the University of Tampa. The restaurant doubles as a small boutique shop and is central to other attractions like the Henry B. Plant Museum. Travelers interested in Tampa and Florida history will enjoy the Plant Museum-- it’s a quick follow-up attraction after breakfast, and lovers of architecture will appreciate the handiwork of architect John A. Wood. After spending the morning visiting the Plant Museum, groups of beer lovers (or anyone interested in the brewing process) can enjoy a tour of Cigar City Brewing, one of the largest craft breweries in the state. Once you’ve enjoyed breakfast, history, and maybe a little beer with your group, hop on your charter bus and head up to Easy Street to visit the Big Cat Rescue, a nonprofit organization focused on rehabilitating orphaned and injured wildcats. The rescue offers a variation of tours for all audiences. Enjoy an educational day learning about both native and exotic animals. Keep in mind, the rescue offers limited tour options for children under the age of 10, so plan accordingly. Shuttle back to the downtown Tampa area on your charter bus to catch a show at the landmark Tampa Theatre. Built in the 1920s, the theatre has an immaculate stage for live shows and screenings of a diverse film roster. Check their schedule ahead of time to see what films they have screening, you may be able to catch a sing-along showing. Spend the rest of the evening exploring historic Ybor City. Known for once being the cigar capital of the US, the area has a heavy Latin influence and is a melting pot of culture, filled with shops, restaurants, cultural centers, and nightlife. Not only does this space include a much-loved restaurant, but it also offers a private event space, bookstore, and coffeehouse. Located on the University of Tampa campus, the museum is a major landmark in the Tampa Bay area. The Plant museum was once part of a hotel but now serves as an ode to the history of Tampa and its previous owner, Henry B. Plant. As one of the largest craft breweries in Florida, Cigar City has produced a multitude of award-winning beers since its opening in 2007. Big Cat Rescue houses 70 rescued exotic and native wildcats, providing education and conservation information to the public. Opened in the 1920s and designed by European architect John Eberson, the Tampa Theatre boasts beautiful architecture and hosts showings of plays, films and musicals. Ybor City is one of few major historic neighborhoods in Florida and is home to popular restaurants and nightlife spots. Make sure you’re rested up for a long second day of adventure in Tampa! Begin the day by taking your charter bus to the Tampa Electric Manatee Viewing Center in Apollo Beach. Taking an hour or so to explore the center and its trails can be a treat for animal lovers or first-time visitors of Florida, as it is one of the few places you’ll find the gentle giants. You can’t really talk about Tampa without mentioning the theme parks. Busch Gardens is a definitie stop for every first-timer in the Tampa Bay area. The theme park has a never ending list of rides, animal habitats and attractions for visitors to enjoy. Water park lovers may want to look into multi-park tickets to also experience Adventure Island when visiting Tampa. If theme parks aren’t your speed or if you’re with a school group with relatively young travelers, the Florida Aquarium is an alternative destination. Recognized as one of the best aquariums in the US, the Florida Aquarium is filled with multiple exhibits containing over 20,000 plants an animals. Visiting the aquarium can also teach an important lesson on the beauty of Florida’s nature and conservation. After spending the day with your group at popular Tampa attractions, enjoy dinner at the historic Columbia Restaurant in Ybor City. Founded in the early 1900s, the restaurant is a Tampa Bay area gem, serving delicious Latin cuisine. Manatees are some of the most recognizable native wildlife to Florida. This marine reserve serves as a place for tourists to safely view the somewhat elusive mammals when they come inland. The viewing center also offers nature trails and a butterfly garden to visiting tourists. When adding this attraction as a stop on your list, keep in mind the center is only open from November through mid-April. The animal-themed amusement park is the most popular attraction in the Tampa area and has a wide array of rides, animals, and fun shows to keep every visitor entertained. Adventure Island serves as the water park branch of Busch Gardens and is conveniently located directly across the street for visitors who bought multi-park passes. The Florida Aquarium has been voted as one of the best aquariums in the US and has multiple exhibits displaying aquatic and terrestrial animals both exotic and native to florida. The aquarium also has The Splash Pad, a water play zone perfect for groups traveling with children. Not only is Columbia a piece of history in the Tampa area, it is one of the oldest restaurants in Florida, being family owned and run for over a century. 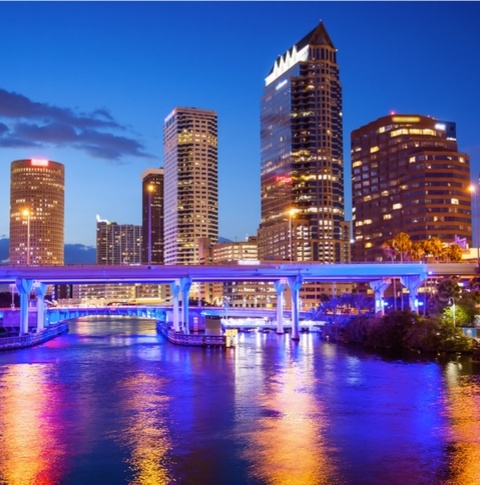 Coordinating group travel to Tampa doesn’t have to be stressful for first-time visitors. At Falcon Charter Bus, we’re here to make the rental process as easy as possible so you can focus on your trip to Tampa. We have experience providing transportation options for groups of all types. So whether you’re a group of Florida natives making the first trek to Tampa from Miami, or if your group is from another Southeastern city like Columbia, Athens or Nashville, we have a bus to meet your needs. Our experienced rental representatives are available 24/7 to provide you with guidance and a free personalized quote. Give us a call at 813-944-3146 to get the rental process started today!